As of April 5, 2019, 23,971 Alabama high school seniors have completed the Free Application for Federal Student Aid (FAFSA). Most of those students will get a Pell Grant worth up to $6,195 to pay for their education after high school. Yet, there are 29,267 Alabama high school seniors that have not filed the FAFSA yet. These students are leaving more than $72 million in free money for college on the table. Cherokee High School in Colbert County has seen a boom in FAFSA completions this year. More than 80 percent of the senior class has completed the FAFSA to get cash to pay for college. To encourage more students to complete the FAFSA, Cherokee High School partnered with Northwest-Shoals Community College. Since the FAFSA opened on October 1, 2018, Northwest-Shoals Community College students have been working with Cherokee High School seniors to help them complete their financial aid forms. Banks, churches, and other community partners can also help high school students with the FAFSA. The parent part of the FAFSA is completely separate from the student part. It is 100 percent private and students cannot access it. Every family looks different. Figure out which parent(s)/guardian(s) to list on the FAFSA using this chart. Tax information entered in the FAFSA is only used to determine how much financial aid your student will get. Nothing else. More than 60 percent of Alabama students qualify for a Pell Grant. The maximum Pell Grant is $6,195. Pell Grants do not have to be paid back. Pell Grants can be used to pay for technical and academic programs at 2-year and 4-year colleges. Students and their families can apply for financial aid right from a smartphone thanks to the myStudentAid mobile app. Completing the FAFSA on the myStudentAid mobile app is the same as completing the FAFSA online or on paper. Download the myStudentAid mobile at the App Store for Apple devices and on Google Play for Android devices. 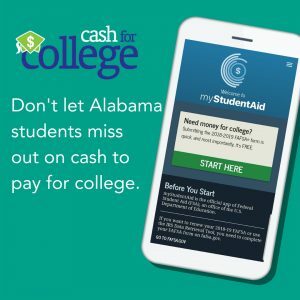 The Cash for College Data Dashboard tracks FAFSA completions in Alabama at the state, county, district, and school level. The dashboard is updated every week, allowing you to follow FAFSA completions at your high school throughout the school year. Educators can also track each student through the FAFSA completion process using the Student Look-up Portal. Please reach out to us if you have any questions, comments, or ideas about all things FAFSA. You can call our office at 205.939.1408 or email us at cashforcollege@alabamapossible.org.